This brand is covered on this site in Sutherland's Handbook of Internally-Geared and Coaster Brake Hubs, also see links on the main coaster-brake page. 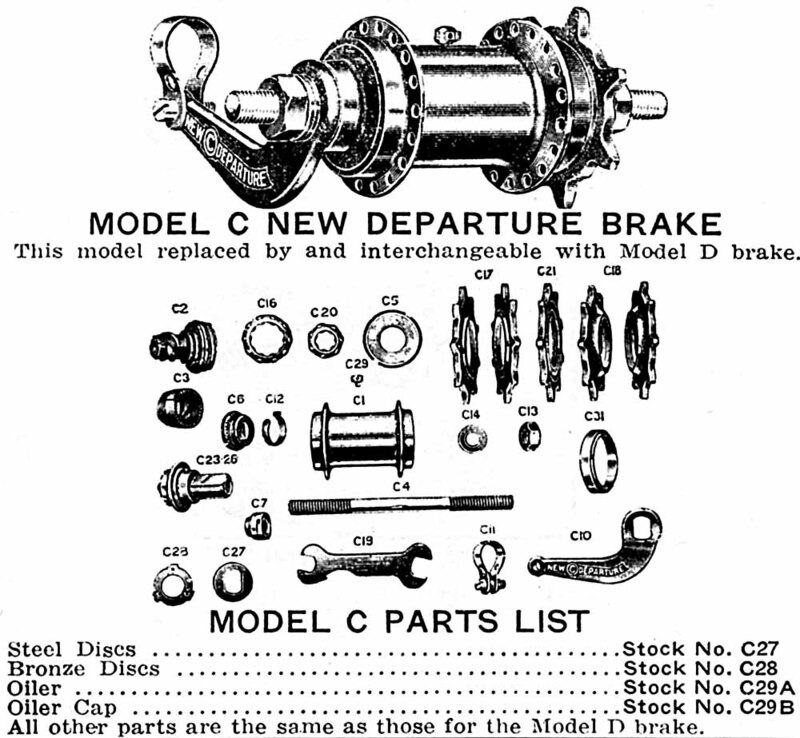 A Flickr album of New Departure service instructions for one, two and three-speed coaster brakes. New Departure service instructions for one-speed coaster brakes models A, C and D.
Please note, we do not possess ANY New Departure parts for sale, please don't ask! 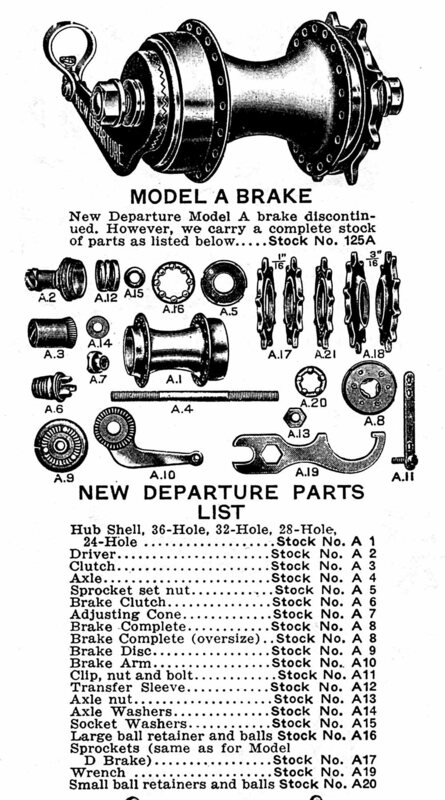 New Departure was for many years one of the top brands of coaster brake. Most models use a stack of discs, alternating steel and bronze as the braking "shoes." Every second disc (D-28 disc) in the stack has three tabs that engage slots in the hub shell. These discs always turn with the hub. The alternate D27 discs have flatted holes and engage the disc support sleeve (D22) These discs do not rotate. When the brake is applied, the thread in the Driver (D2) presses the Clutch Sleeve (D3) against the Brake Clutch (D6) which in turn presses against the stack of discs. The friction between the discs slows the bike down. When you pedal forward, the thread in the Driver (D2) pulls the Clutch Sleeve (D3) against the narrowed section of the hub shell. The serrations in the tapered end of the Clutch Sleeve grab the matching surface of the hub shell interior. 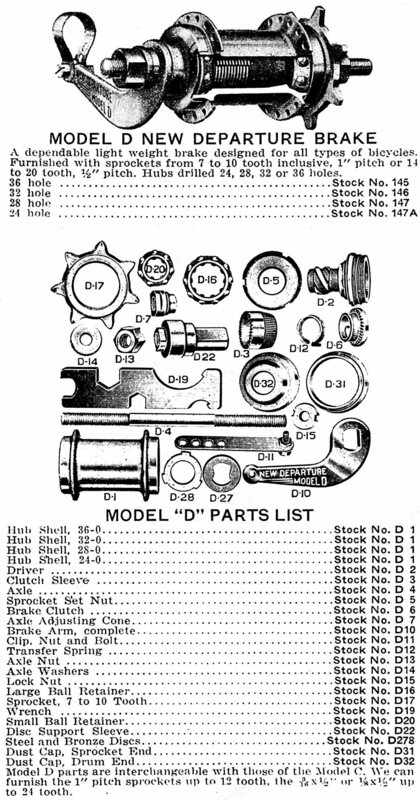 Here are some images from the 1938 Island Cycle catalogue. The Model A was mainly popular in the 1920s.